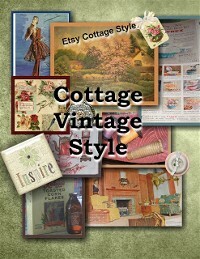 Welcome Friends to Etsy Cottage Style's newest and second week of the month's blog link party sharing our Cottage Vintage Style treasures. So happy you could join me today as I updated my vintage dining room and right in time to share for this weeks fun from ECS. My hutch is a treasure and I have enjoyed it for over 30+ years. Last January, I painted it black with distress and truly love this look taking it from a country style to more of a farmhouse cottage look. The three glass doors on the top had grids that I removed and recently added some stain glass appliques that can be removed if needed. Added ivory crackled knobs and carved wood accents to the top and lower doors. The center drawers are the original hardward painted. The top shares space with my white rooster collection and cloches with white birds. The rose painting is very old and a found treasure from a junkin trip. The inside stores country whites and glass treasures. I simply enjoy a mix of old keepsakes changing this around often with the seasons. Across the room, sits an old Barley Twist buffet. On the wall above is an old shelf wall cabinet for display and storage. To the bottom of the wall cabinet I added double pegs placed close together for a creative way to display and hang vintage stemware. Love the Barley Twist Legs with added distress and painted black. I stenciled a french design and simply set a collection of what not treasures to the top in an old metal tray. Quick to move away, when I might need to use the buffet for serving. On the table I set a vintage oval white lace tablecloth that is 40 years old and in excellent condition. I have enjoyed this my entire married life and love it. Thank you for visiting my Cottage Vintage Style dining room with a farmhouse style look. Joining Cottage Vintage Style from Etsy Cottage Style.